The Amathinidae is a family represented in Australia by only 5 species. These are assigned to two genera which are remarkably different in shell form. In the genus Amathina shells are limpet shaped, but shells of Leucotina are typical of broadly elongate coiled gastropods. Until recently the genus Amathina was placed in the Capulidae or Hipponicidae, but Ponder (1987) investigated the anatomy and established the family Amathinidae for the genus. Later, the anatomy of Leuocotina was investigated by Hori amd Tsuchida (1995), who confirmed the placement in Amathinidae. Amathinids are ectoparasites that live attached to large bivalves, such as Pinna and oysters. They position themselves close to the shell margin, usually in the vicinity of the exhalent siphon. They have a long, slender proboscis and, lacking radula and jaws, probably feed by sucking body fluids from the host. They are simultaneous hermaphrodites i.e. they contain both male and female reproductive organs, producing eggs and sperm simultaneously. In the tropical Indo-West Pacific species Amathina tricarina eggs capsules are laid in clusters in jelly, apparently releasing as free-swimming veligers into the sea. In NSW one species of Amathina and two species of Leucotina are recognised. The genus Amathina has posed no taxonomic difficulty in the past, apart from the issue of family position, but Leucotina was problematic until Beu (2004) published a review of the fossil and recent species. 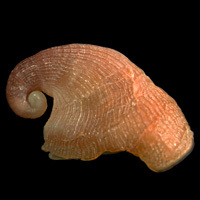 He found that most species that had been referred to Leucotina were variants of Leucotina casta, which is very variable in shell form and size. He listed 13 synonyms of L. casta, including L. concinna, the name by which the species had most commonly been known in Australia. Ponder, W.F. 1987. The anatomy and relationships of the Pyramidellacean limpet Amathina tricarinata (Mollusca: Gastropoda). Asian Marine Biology 4: 1-34. Hori, S. & Tsuchida, E. 1995. A revision of the systematic position of genus Leucotina (Gastropoda: Heterostropha). Venus 54(4): 279-293. All the NSW species referred to the family are covered here. Leucotina amoena (A. Adams, 1853) is listed in the Australian Faunal Directory as occurring in NSW, but examination of the two specimens so identified in the Australian Museum collection shows them to be L. casta (A. Adams, 1853). Amathina species are readily identified by their limpet shape, but Leucotina shells show no obvious characters that place them in Amathinidae. Leocotina micra can be identified by its small size and distinctive sculpture, but L. casta can only be identified by a detailed study of its specific characters.